Cyclical Stock - What Does It Mean? 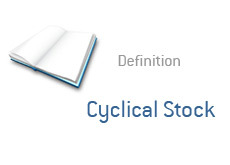 What is a "cyclical stock"? What is the definition of a cyclical stock? To understand the definition of a cyclical stock, you need to understand a bit about the economy. With the economy, you have periods of expansion and periods of contraction. This is known as the "business cycle". Cyclical stocks are those that do well when the economy is in expansion mode. Cyclical stocks will have higher profits (and very likely trade at a higher price) when the economy is expanding. On the other hand, cyclical stocks will experience shrinking profits when the economy is contracting. An example of a cyclical stock or company? Furniture manufacturers. Car makers. Travel companies. All three do well when the economy is expanding (as people have more money to spend), and all three see their profits shrink when the economy is in contraction mode. The opposite of a cyclical stock is a "defensive stock". These are stocks that hold up well during times of economic distress because demand for their products doesn't tend to decrease very much, even though people have less money to spend. Think McDonald's. Think tobacco companies. These are example of "defensive stocks".